Stephen James Harmison, MBE, DL (born 23 October 1978) is an English football manager and former English cricketer. Currently manager of Ashington in the Northern Football League. Primarily a fast bowler, he represented England in cricket, appearing in 63 Tests, 58 ODIs, and 2 T20s. He also played county cricket for Durham and Yorkshire. He made his Test and ODI debut for England in 2002, and achieved modest success in these early stages of his career, showing promise as a capable strike bowler for England. This was borne out during the tour of the West Indies in 2003–04, where he produced some of his finest bowling and went on to become the highest wicker-taker in the series. He followed it up by playing a vital role in England's victory in the 2005 Ashes series, and was selected as one of the Wisden Cricketers of the Year in 2005. At the time, he was regarded as one of the world's best fast bowlers. Harmison's performance following the 2005 Ashes victory was inconsistent, and he announced his retirement from ODIs in 2006. His problems were compounded by niggling fitness worries and intense competition for a place in the English team. Although he came out of ODI retirement in 2008, his place in the squad was never permanent, ultimately leading to his being dropped since 2009. His last Test for England was the final test of the 2009 Ashes series, and he played his last ODI against West Indies in the same year. He formally announced his retirement from the game in October 2013. 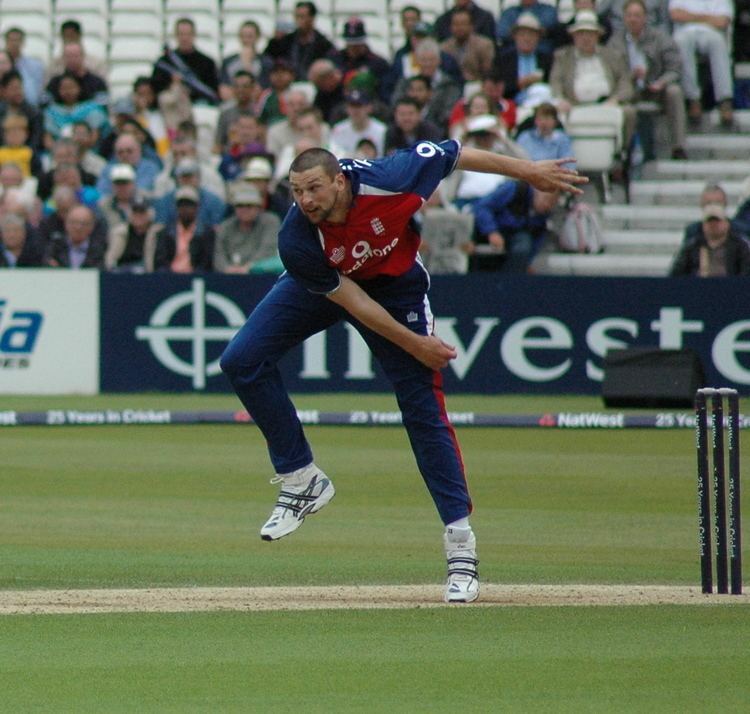 Harmison's success during his prime was attributed to his ability to extract bounce from any pitch – mainly due to his height being 6'4" – and his ability to swing the ball while maintaining speeds of over 90 mph. However, his lack of consistency often led to lethal spells being mixed up with equally bad bowling (a notable example is the opening ball of the 2006 Ashes, which he bowled straight to second slip, resulting in a wide that media commentators dubbed as "the worst ball in history"). Nevertheless, his ability with the ball was never questioned; in 2007, former Australian cricketer Shane Warne named Harmison in his list of 50 greatest cricketers, stating: "on his day, he is one of the most awkward bowlers [to face] in the world". Harmison was born and brought up in Ashington, Northumberland, and is the eldest of 3 brothers and 1 sister (the youngest, Ben Harmison, who latterly played first class cricket for Kent, and formerly played for Harmison's side, Durham..) As a teenager, Harmison played for his local football team, Ashington A.F.C. and local club team Ashington Hirst Progressive F.C, before deciding to concentrate on cricket. Steve Harmison was first selected for an England squad in May 2000 during the tour to England by Zimbabwe, but did not play. As part of an ECB National Academy touring team that also contained Andrew Strauss, Ian Bell and Robert Key, Harmison showed clear signs of his ability in the tour of Australia in 2001–02. In August 2002, Harmison made his Test match debut at Trent Bridge against India, replacing the injured Simon Jones. Originally lacking somewhat in control, he bowled seven consecutive wides in the first match of the tour of Australia, against the ACB Chairman's XI's at Lilac Hill in 2002. However, promising performances later in the tour saw him named in the World Cup squad, although he did not take to the field in any of the matches. He was then awarded with a six-month central contract by the ECB, but this was not renewed in September 2003. Despite media complaints about his ability, he was named in the England squad for the winter tour to Bangladesh and Sri Lanka, partially due to injuries to other players. Harmison gave a man-of-the-match performance in the opening Test against Bangladesh, taking 9 wickets for 79 on a slow wicket, before succumbing to a back injury and missing the matches against Sri Lanka. Despite the injury, he'd done enough to be selected for the winter tour to the West Indies, and it was there he sealed his arrival, taking 7 wickets at the cost of just 12 runs as the West Indies collapsed to their lowest ever Test total of 47 all out. Harmison went on to win the Man-of-the-Series award after taking 23 wickets in the four Tests. With the West Indies touring England in 2004, it was expected that Harmison, who had also shone in the three-match Test series against New Zealand earlier in 2004, would again be England's lead bowler, and the West Indies captain Brian Lara went as far as suggesting that England had no plan B after Harmison. However, Harmison was outshone by spin bowler Ashley Giles for the first three Tests, before he took 9 wickets in the final Test match. In that final match, he also punished the West Indies bowling with the bat, hitting three sixes and three fours in a brief innings ending at 34 not out. Harmison's bowling performance in this match took him to the top of the Pricewaterhousecoopers cricket ratings. In 2004, Harmison took 67 wickets in just 13 matches, at a superb average of 23.92. Harmison disappointed with the ball on the 2004–05 England tour of South Africa, taking just 9 wickets in the Test series at the extremely high average of 73.22. During this series, he spoke frankly about his homesickness on foreign tours. However, his solid performances with the bat, including an innings high score of 42 in the 3rd Test, led some commentators to note, not altogether jokingly, that he was now making a case to be considered a tail all-rounder. Despite these disappointments, he was still named as one of five cricketers of the year by Wisden Cricketer's Almanack in 2005. In summer 2005 Harmison was part of the England team that regained The Ashes from Australia. He started the series well, with a hostile opening spell on the first day of the 1st Test in which he cut Ricky Ponting's face with a short ball and took five wickets, including that of Ponting. Although later outshone by Flintoff and Jones, he exerted pressure and claimed important wickets throughout. His most important and dazzling wicket, some might say, was the slower-ball yorker with which he bowled Michael Clarke, described by Mark Nicholas, commentating for Channel 4, as "one of the great balls". Marcus Trescothick and Andrew Flintoff believed he had the second-worst split-fingered slower ball in the squad, after Flintoff. Harmison also took the final wicket of Michael Kasprowicz the next day, caught behind from a bouncer by Geraint Jones for England to win by the wafer thin margin of only two runs. England had been massive favourites overnight, but Australia, needing over a hundred to win with only two wickets left had almost pulled a victory from the very jaws of defeat thanks to the tail end efforts of Shane Warne, Brett Lee and Kasprowicz until Harmison struck. In July 2006, during the series against Pakistan, Harmison took 6/19 off just 13 overs in the first innings as Pakistan were skittled for just 119. In the second he again shared the 10 wickets with Monty Panesar, taking 5/57. He thus took his first 10 wicket haul in a match, taking 11/76. This came in his 45th Test match, and was the best match bowling figures at Old Trafford since Jim Laker's 19/90, exactly 50 years previously. During the 2006 ICC Champions Trophy Harmison's form came under scrutiny, and he was dropped from England's final match against the West Indies. In November 2006, Harmison bowled the first ball of the eagerly awaited 2006-07 Ashes series at the Gabba in Brisbane, but erred by bowling a wide straight to Andrew Flintoff at second slip. After another below par performance in Adelaide he would find some form in Perth with 4/48 in the 1st innings. On 7 August 2008 Harmison returned to the England Test team for the Fourth Test match versus South Africa. He took two wickets for 49 runs in helping England to dismiss South Africa for 194 on the first day of the match. Harmison's first ball (the first ball of the match) nearly took a wicket (see picture). In England's first innings Harmison hit a career high Test match score of 49 not out (59 balls,8 fours). He ran teammate Monty Panesar out trying to reach 50. After the Test series on 21 August, Harmison came out of ODI retirement after being persuaded by the new England captain, Kevin Pietersen. On his ODI return versus South Africa on 22 August, he took two wickets for 43 runs, this was crucial in England winning the match. On 7 August 2009, exactly one year after his previous return, Harmison was selected to play in the 4th Ashes Test at Headingley, replacing the injured Andrew Flintoff. In this Test, he equalled Mike Atherton & then Monty Panesar's record for the most Test ducks scored by an Englishman (20), caught behind off Peter Siddle as England collapsed to 102 all out against Australia's seam bowling attack. Whereas Atherton had played 115 tests, Harmison achieved the feat in his 62nd test. He also took the wicket of Simon Katich caught in the gully for a duck in the second over of Australia's innings. He had bowled well to a supportive audience, and should have had Michael Clarke late on in the first day but the appeal was turned down. He went on to take the wicket of Australian keeper Brad Haddin. In his second innings Harmison made 19 no out off 28 balls but could not prevent the Australians from totalling 445 and proceeding to an innings victory. Harmison went on to play in the 5th Test at the Oval; on the final day of the series, Harmison claimed the three penultimate wickets to fall, including those of Peter Siddle and Stuart Clark with consecutive deliveries, both caught after attempting to play to the leg side, to create a unique opportunity to win the Ashes with a hat-trick (Ben Hilfenhaus successfully blocked the hat-trick ball). England won by 197 runs to take the series 2–1. 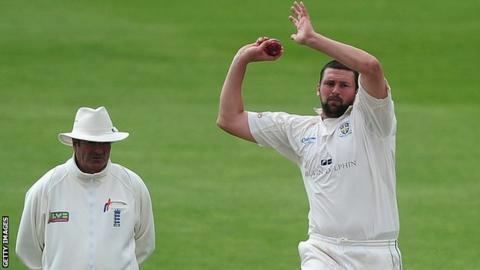 Following his retirement from cricket, Harmison has featured on Sky Sports' cricket programming as a pundit and commentator. However, on 8 February 2015, Harmison was appointed manager of Ashington in the ninth-tier of English football. "I have a family. I have kids that need me around and they will dictate the decisions I make on my career....My international career will finish when my family needs me to be around a bit more." 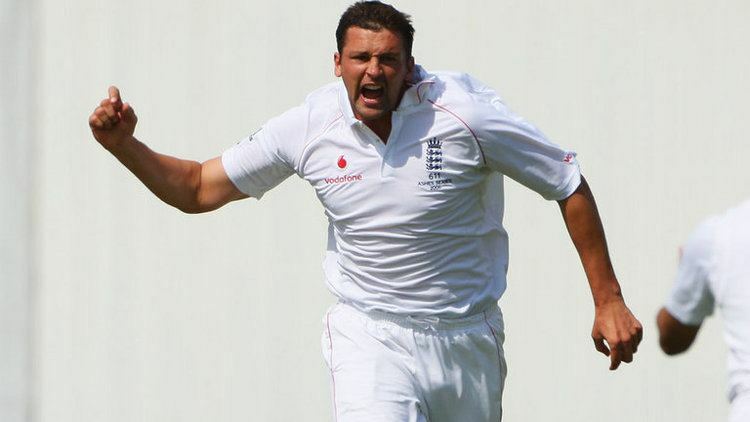 Steve Harmison announced his retirement from all forms of games on 6 October 2013. After not playing even a single test for England in the last 4 years, he officially ended his career on his own terms from all forms of the game.